Let us first try to understand what database link means. Supposing we have a user (test) in database orcl within host server testsrv. Now test user can access all objects residing in the same schema, i.e. test. Also test can access objects residing in another user (say test1) in the same database (or SID), by the help of dot operator. But what if the Database changes? How to access objects of a different database? Also what if the host server is a remote one? Dot operator will no more help now. Therein lies the importance of database link. As the name suggests it is actually a link to objects residing in other databases. So for example the current user is test. Hostname is testsrv. SID is orcl. Access table emp_info residing in user test1, hostname- testsrv1, SID - orcl1. 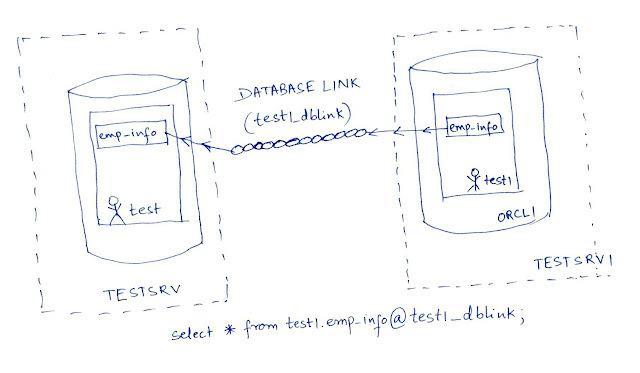 For this we have to create a database link in test user at testsrv. Note: If we feel that 'test1.emp_info@test1_dblink' is too big a nomenclature, then we can use a synonym. Click here to know about synonyms. To conclude, a database link is a pointer in the local database that lets you access objects on a remote database.